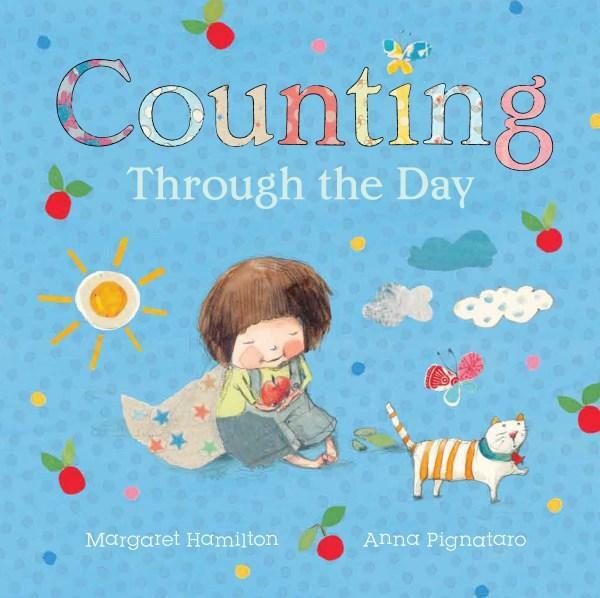 What starts off as a quite a typical counting book for toddlers takes a lovely and unexpected twist when the counting from 1 through to 12 suddenly jumps to 20, then to hundreds (of books piled up on the floor), thousands (of raindrops falling from the sky) and millions (of stars to count), before settling back down nicely to one (silver moon shining big and bright). It's a wonderful way to introduce the concept of very large numbers to toddlers, and truly sets this book apart from the many other counting books available. The soft lyrical rhyming text is a pleasure to read, building slowly from the beginning of the toddler's day, counting through playtime, meals and chores, before settling down perfectly to a soothing bedtime story. Anna Pignataro's divine illustrations are so (oh, so!) beautiful. Reminiscent of Polly Dunbar's work, she captures the joy of the everyday from the perspective of the unisex toddler character, using collage elements and an absolutely exquisite colour palette. Each number (from 1-12 and 20) is worked beautifully into the illustrations, using wide uncluttered spaces to allow clear visibility of the number in numeric format, but with so much detail in the surrounding pictures that readers will never tire of looking at them over and over again. From the first moment of picking it up, until the last close of the cover, this book radiates a sweetness and a beauty that will leave a whimsical whisper in the air even after the last page has been turned.